US 2005 $ ISBN-10: ? 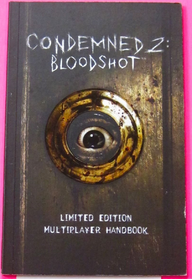 Condemned 2: Bloodshot Limited Edition Multiplayer Handbook is an official guide book for the multiplayer component of Condemned 2: Bloodshot. It was given away with Pre-Orders for the game at GameStops in America.